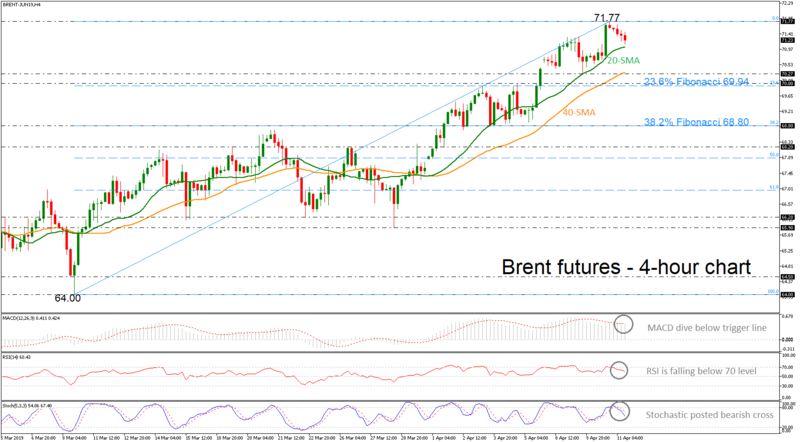 Brent crude oil futures are easing on Thursday below the multi-month high of 71.77, heading towards the 20-simple moving average (SMA) in the 4-hour chart. According to the MACD, the market seems to be ready for negative correction as the index dropped beneath the trigger line and the RSI found resistance at the 70 level. Moreover, the stochastic is edging lower after it touched the overbought territory. Should the price extend declines, the 70.72 level, which overlaps with the 40-SMA could be the first support to have in mind. Below that, the focus could shift straight to 70.00, which stands near the 23.6% Fibonacci retracement level of the upleg from 64.00 to 71.77. On the other hand, a recovery could retest the 71.77 key mark before attention turns to the 72.00 and the to the 73.00 psychological levels. Overall, Brent futures hold a bullish profile both in the short and the medium-term.